and ease in the kitchen. On a cold Saturday Morning last winter, I stood at a big butcher block table in a country kitchen in Peterborough, New Hampshire, contemplating a head of cabbage. It was the first session of a cooking class taught by Hiroshi Hayashi, who teaches more like a Zen master than a master chef. First we had visualized our perfect selves making delicious food. Then we had each spent 15 minutes sharpening a single-edged seven-by-two-inch knife. Now we stood before a pile of glistening vegetables, about to learn how to handle what Hiroshi called "the most basic tool in cooking." "The knife should be a part fo your fingers," he said in accented English. "Slide the knife - don't chop. Don't use force. Don't think of cutting a vegetable, think of moving the knife." On my right, a woman from New York City began confidently sliding her knife, creating paper-thin slices of cabbage. "Don't need to conquer food," Hiroshi was saying. "Nature is harmonious." But my knife, which felt as big as a samurai sword, was clutched in a death grip and hacked off slices as thick as Wonder Bread. Hiroshi leaned forward. "There is no mystery. This is not test - just practice. Slide the knife." Suddenly I got it. Instead of attacking the food, my knife began effortlessly slicing cabbage. Hiroshi nodded and moved on. I think of this simple advice every time I pick up a knife. And when I mentioned the visualization techniques to one of the best cooks - and least New Age person - I know, she smiled in complete understanding. "I always do that." "People think they need recipes and advanced lessons," Hiroshi says. "They need basics. People create good food - then they make it complicated and complications make terrible food. Food should be natural, simple, and easy to cook." It should also be delicious, delicate, and low in calories and cholesterol - the kind of cooking Hiroshi has been teaching and serving for more than 20 years. 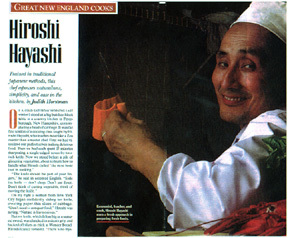 A traditionally trained Japanese chef, Hiroshi is perhaps best known for the two restaurants he opened in the 1970s that were frequented by such celebrities as John Lennon and Yoko Ono: the Seventh Inn in Boston and Latacarta across the river in Harvard Square. 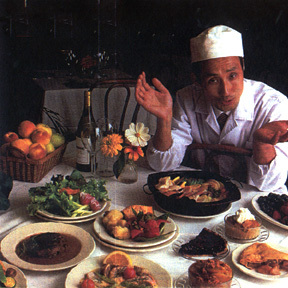 In 1987, Hiroshi closed both and moved Latacarta and his entire staff to School Street in Peterborough. He then set up a cooking school in a rambling former inn nearby that is now also his home. Over the years more than 300 apprentices have passed through his kitchen, including chefs Paul and Elizabeth sustick of their restaurant (called Paul and Elizabeth's) in Northampton, Massachusetts; Douglas Dale of Wolfdale in Lake Tahoe, California; and Michael Gross of the New Prospect Café in Brooklyn, New York. Hiroshi is consulted by those with cancer and other serious illnesses and recently began giving cooking lessons to the local hospital staff. He calls his cooking "epicurean collage," a mix of fresh, natural ingredients and simple techniques that span many cultures. Just about the only prepared foods in his kitchen are tomato paste, pasta, soy sauce, and wines. Among his specialties are a delicate salmon with dill sauce, a Japanese style beef tenderloin, Mexican enchiladas, Bavarian chicken, los of pasta entrées, and a range of vegetable dishes. "Natural food feels good," Hiroshi says. "Food saturated with fat and seasonings punishes your body." The sauce for the salmon contains less than half the fat of standard cream sauce. One night he made an egg custard soup with scrod and shrimp, cooked and served in individual covered cups. It tasted rich, but was it? "One half an egg per cup," he answered, as we scraped the bowls clean. His dishes are created in a kitchen that is probably less well equipped than the average summer camp. "Cooking is a very simple matter," Hiroshi says. "It is too simple. That is why people ignore it. Rich people have modern style kitchens with much equipment where they can't cook. In cooking, primitive style is better." The Latacarta kitchen as a massive 12-burner Vulcan stove and a deep-fat fryer for tempura. There are no microwaves, blenders, beaters or heaters in sight. The food is chopped, whisked, and prepared by hand and cooked in iron or stainless steel only. He uses bamboo skewers - not timers - to test for doneness. The large single-edged knives are custom made for him in Boston (by Market Grinding Co.). He could use different sized knives, but why make things more complicated? At home, he confesses, his wife, Masako, has a blender and an electric rice cooker, but he doesn't use them for his cooking classes. Hiroshi's cooking gently transforms ingredients through fire, time, and seasonings. He believes most food should be cooked slowly, to bring out the natural flavor and sweetness. (Red meat - like his Teppanyaki Beef - is an exception: it is cooked over a very hot flame to sear the outside and leave the inside rare.) Time extends not just to cooking, but to the seasons as well: he chooses foods in season locally, which allows the freshest ingredients. He reminds students not to fight time by buying out of season or to fight the natural taste of food with bizarre treatments. All dishes are prepared in what must be the quietest kitchen in New Hampshire: It is like a meditation center, with no loud music or idle conversation to interfere with preparing the food. Hiroshi tacks up little sketches of new presentations and even at home will doodle pictures of what he's about to cook. "Intuition and feeling is most important when you cook. It affects food. You can't wander: you must concentrate, you must know what you are doing," he says. "Food makes the body. Food changes people's way of life. If we know right way of cooking and eating, we can change people's lives." The Latacarta menu includes a manifesto of his beliefs on the back page, tracing the origins of cooking to the New Age movement of the 1960s that blended Eastern philosophy with Western idealism and stating his desire to nurse society and nature back to health with freash and pure foods. The truth is, Hiroshi loves to cook. The son of an engineer, he took his degree in Japan in international economics and then appalled his family by becoming a cook. The apprenticeship in Japan took ten years. He says he may be among the last group to take the time to learn traditional Japanese methods. Hiroshi can be found at Latacarta six days a week; on his one day off, he cooks. Dinner for friends at the Hayashis' home can be a traditional Japanese feast that takes five hours to prepare and consume and might include shrimp baked on autumn maple leaves in a salt bowl, sushi, crab salad in orange baskets, and vegetables transformed into blossoms, leaves, and other fanciful shapes by his talented knife-work. Ir it can be a simple, one-pot dinner of sautéed and simmered vegetables and seafood served over pasta with the addictive Japanese pickles, tsukemono. The Hayashis' farmhouse seems to have only two rooms - the kitchen and the dining room the seats at least 12 - and there is usually a crowd: former and current cooking students looking for assistance or just company. A huge black dog, a Bouvier named Boo-Boo, wanders through occasionally. Masako Hayashi is an accomplished kimono artisan who has sewn for Boston and New York opera companies; her striking kimonos and contemporary Japanese art decorate the walls of an otherwise quintessential New England farmhouse. Blending East and West is at the core of Hiroshi's cooking, but there are no rigid rules. "If ten people make same food, it comes out ten different ways," he says. On one of the handouts from his cooking classes is the statement: "Do not neglect your own experience, including your mistakes."